Initial remarks: Aside from pairs and 3-of-a-kind, each 3-card hand must be represented in strictly decreasing rank order where A is highest. E.g AKJ is valid; these are invalid AKJ, JAK, etc. Pairs must be written like XXY, never XYX nor YXX. For a pair or 3-of-a-kind, suits can be in any order. These are all valid: 3C3DAS, 3D3CAS, 4S4D4H, 4H4H4S, etc. Note that if you know the second card in a hand, you can infer that the first card is either higher or of the same rank. If the first and third cards are the same rank, then you must have 3-of-a-kind. If the first and third cards differ in rank by 2 then you either have a pair of the first rank or a straight (or straight flush); e.g. AxQ must be either AAQ or AKQ. 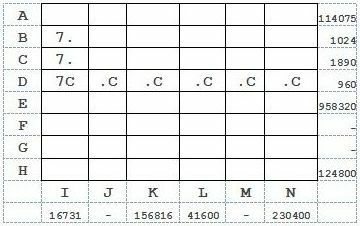 As I go, the partially filled grids show the unaccounted for product of each row and column to the right and below. Rows B and D have one factor 7; Row C has two 7’s. 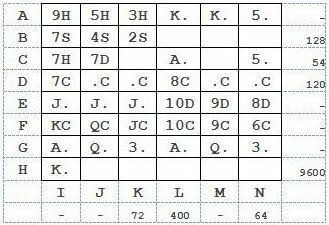 Col I has three 7s; so the 7s are at BI, CI, DI and either CJ or CM since 7 does not divide cols K, L or N. Row D is all clubs. Row E has three Js; col I has one and col K has two. No other rows beside F & G have Js. So there are Js at EI and EK; player 1 then has JxJ in row E which can only be three Js. If GK were a J then so would GN (split hands must have the exact same card ranks). That would make five Js; so the fourth J is at FK. Since E has no clubs; JC is at FK. The Js in EI-K must be DHS in some order; so EL-N are all Ds. The only way to get product 958320 is if the three other cards are 10, 9 & 8. So EL-N = 10D, 9D, 8D. Player 2’s straight flush beats player 1’s 3-of-a-kind. The three Qs must be among FJ, FM, GJ, GM. Two of them must be in row G because of the split. So GI must be ranked higher than Q with GL having the same rank. They cannot both be K’s for there are two Ks in row A and one in row H. So GI and GL are both As. The second club in col I cannot be at GI since AC is in OD. So the club must be at FI. Similarly the second club in col L is at FL. 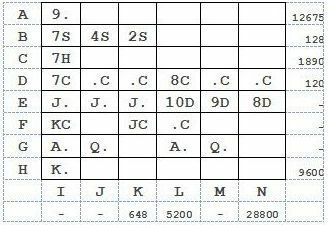 The six cards in row B must have one of these rank sets: (A 8 8 8 7 2) (A 8 8 7 4 4) (8 8 7 4 2 2) (8 7 4 4 4 2). [(7 4 4 4 4 4) would give us too many 4’s of course]. Player 1’s highest ranked card is a 7 and player 1 beats player 2. 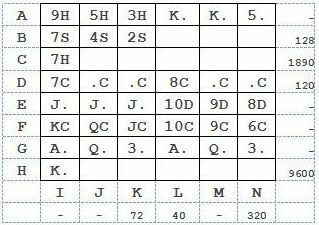 The only ways this can work are if row B is either 742 882 or 742 448 and player 1 has a spade flush beating player 2’s pair of 4s or 8s. So BI-K = 7S 4S 2S. CI=7H (no diamond is in col I). Since the AC is unavailable, the only way to factor 6720 into 6 unique clubs is 8 7 5 4 3 2. Since player 1’s highest card is 7, the 8 is in player 2’s hand and must be the highest card. DL must be the 8C. Player 2 will have the higher flush. The three remaining cards in col I must be KK9 in some order. 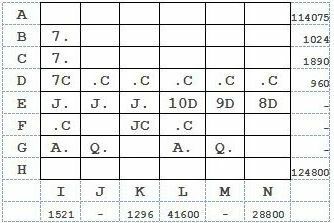 9 is not a factor of 124800 so HI is a K.
Rows F & G must have six clubs between them. FK=JC. Suppose FI=9C. Then player 1 has a pair of 9s, so FJ is not a club. The third Q would be at FM. So there is one club among the three Qs at FM, GJ and GM. Neither A at GI nor GL is a club since AC is in OD. GK is not a club since we already have two in col K. That means the three other clubs would be at FL, FN and GN. But that would make three clubs in col N. Consequently FI = KC and AI is a 9. 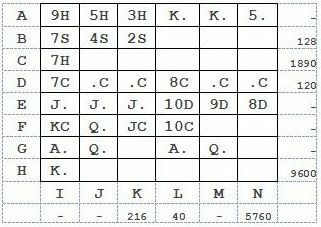 Row A must consist of KK9553, so player 2 has a pair of Ks; player must have a flush to be the winner and that must be in hearts. Row A must be 9H 5H 3H K K 5. 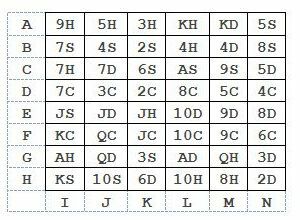 Since all the K’s and J’s are placed, player 1’s hand (KxJ) in row F must be KQJ. The unaccounted for clubs are the 10, 9 and 6 (the ones in row D are 2, 3, 4, and 5). Neither 9 nor 6 divides 416000, so FL = 10C. The product of all the card face values other than the Q’s is (13*11! )* (13*11! )* (13*11! )* (13*11!). If you take that and divide by the 6 clued row products, the 1*2*6 from OD, the (13*11*10*1*1) already placed in rows F & G, you find that the four values in FM, FN, GK and GN must have product 486=2*3^5. They can have rank at most 9 (no As). There are only two possibilities where GK=GN: 9,6,3,3 or 3,2,9,9. The second one would mean there would be no place for the 6C. So FM, FN, GK and GN must be 9, 6, 3, 3. Thus the 9C and 6C are in FM and FN; GK & GN are both 3. Player 2 has a flush. So player 1 must have a flush also (actually a straight flush) and FJ=QC. Neither rows B nor H are divisible by 9. 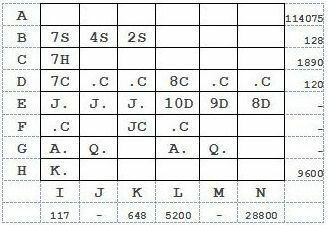 So the 9S is in row C. The two remaining 6s must be split between rows C and H. So row C has 7 7 9 & 6. The two remaining cells must have product = 5 and row C is comprised of A,9,7,7,6,5. Player 1 cannot have 765 since 5 does not divide col K’s product. Player 1 wins with a pair of 7’s. 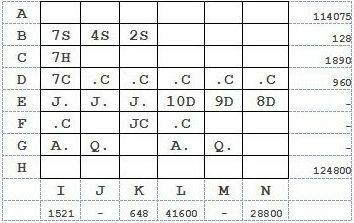 Row C must be one of 77A965, 779A65, 776A95 or 775A96. 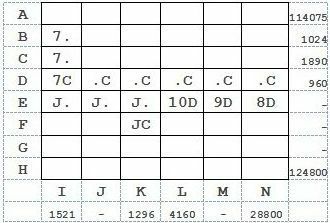 Since 5 does not divide col K, 775A96 is wrong and CN=5. 9 does not divide L so 77A965 is wrong and CL=A. Counting the 5C somewhere in row D, all the 5’s are now accounted for. If BL were an 8, HL would be a 5, so BL = 4 and HL = 10 and row B is now known to be 742448. 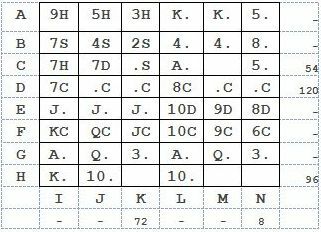 In row H, player 1 cannot have a flush (there are two each of S, H, D), a straight, or a pair of K’s so player 1 wins with just the high card. So the final ten cannot be in player 2’s hand (that would give a pair of 10s); it must be the second best card for player 1. So HJ is a 10. The three unknown face values in col K have product 72. One of them (DK) is the 2, 3, or 4C. So the product of the other two is 36, 24 or 18. None of those are divisible by 8 so HK is not 8. Similarly HN cannot be an 8 since DN*HN=8 and DN>1. So the final 8 is at HM. 6H is in OD so HK=6D. For col K we have used CCDHSS. That leaves HS. The 3H is already used, so GK=3S and EK=JH. There are no diamonds in col I, so EI=JS and EJ=JD. 2H is in OD so HN must be 2D. The 4S is at BJ, so the fourth spade in row B must be the 8. The 8 in row H must be a heart. That leaves HSS in row H. The two 10s must consume H and S, so the K must be KS. 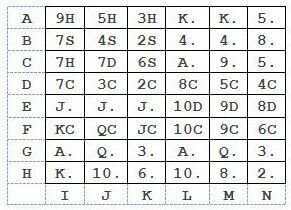 Then the two Ks in row A must be DH and the spade must be the 5S. The 5 in row C must be 5D. The 3 in col N is 3D. The 9 at CM is 9S. So for row C we have DDHSS. The A at CL=AS. For col I we have set CCHHSSS, so GI must be AH and GL is AD. For col L, we have set CCDDS, so AL, BL and HL are all hearts. So AM=KD, BM=4D and HJ=10S. Finally we have the two Q’s in row G, QH and QD. If GM were QD, then player 2 would have a flush. So GJ=QD and GM=QH. This entry was posted on 7 June 2013 at 4:01 pm	and is filed under Solving Blogs. You can follow any responses to this entry through the RSS 2.0 feed. You can leave a response, or trackback from your own site.